Chief of Police Patrick Gurcsik posed for a photo with the second grade safety poster winners at last week’s council meeting. From left, there is Jack Gallinaro, Hurffville Elementary School, Marissa Brady, Birches Elementary School, Amelia Mulhern, Bells Elementary School, Toni Carcillo, Thomas Jefferson Elementary School, Chief of Police Patrick Gurcsik, Kyle Martinez, Whitman Elementary School and Giana Caveng, Wedgwood Elementary School. 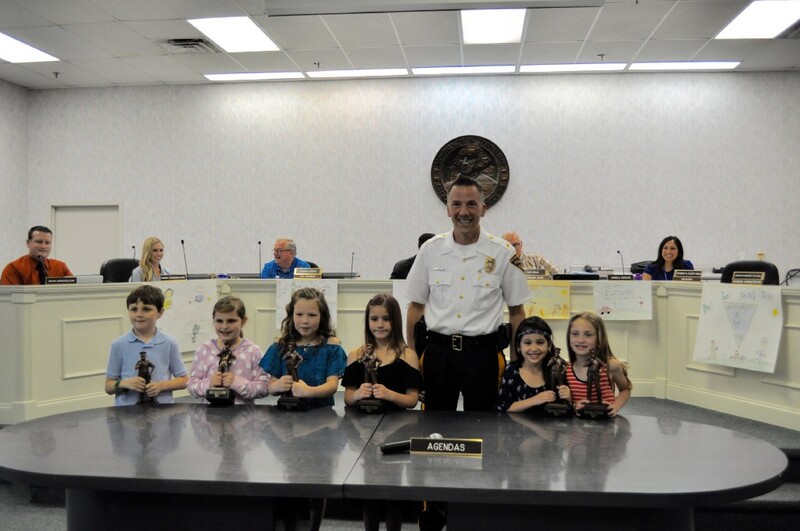 Chief of Police Patrick Gurcsik recognized the winners of the safety poster contest, awarding one second grader from each elementary school a trophy for their achievement. Last month, police officers held assemblies for every second-grade class, teaching students about Internet safety, stranger danger, bicycle safety and what to do in an emergency. Students were instructed to create a poster that represented what they had learned. The school principals and Mayor Joann Gattinelli judged the posters’ message, creativity, neatness and overall appearance. Winners from each school included: Marissa Brady, Birches Elementary School; Amelia Mulhern, Bells Elementary School; Jack Gallinaro, Hurffville Elementary School; Toni Carcillo, Thomas Jefferson Elementary School; Giana Caveng, Wedgwood Elementary School; and Kyle Martinez, Whitman Elementary School. Robert Timmons (center) was proclaimed as the Fourth of July parade grand marshal at last week’s council meeting. Pictured with him are members of the parade committee, from left, Michelle Martin, Gina Gurcsik, Chief of Police Patrick Gurcsik, Councilman Joseph Perry and Councilwoman Angela Donato. 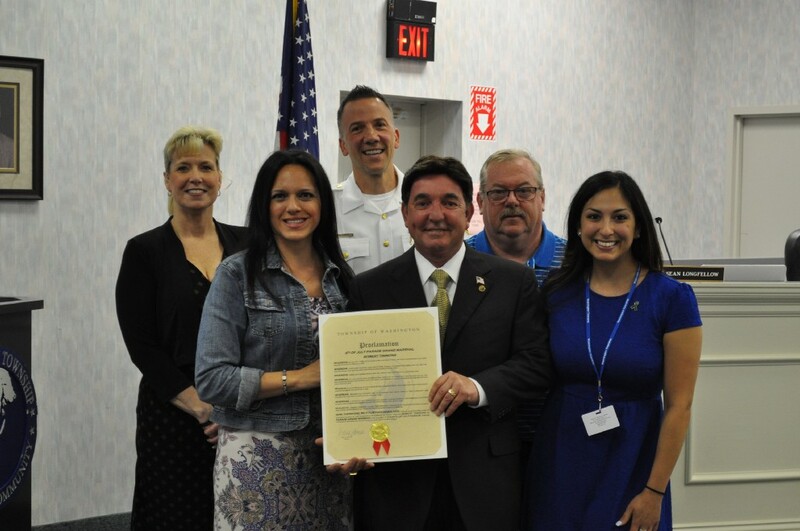 Councilwoman Angela Donato and members of the Fourth of July parade committee presented a proclamation naming this year’s parade grand marshal. Timmons, chosen for his pride and dedication to Washington Township, will lead the parade. “Thank you for letting me live the dream,” Timmons said. Community members, representatives and dam owners of Lake Kandle, Bells Lake and Wedgwood Country Club requested the municipality’s support in state loan applications regarding repairs and permits. Each group’s loan required the township to co-sign for approval. Jay Kandle, owner of Lake Kandle, was requesting $150,000 for repairs that had already been made through separate private borrowing. In 2005, Kandle had been approved for a $250,000 state loan to make repairs to the dam and received a co-sign from the municipality in 2006, however, the cost of repairs totaled closer to $440,000. The loan he was requesting this year was to cover those additional costs that were not covered years ago. Representatives and residents of Bells Lake were requesting support for a loan in the amount of $900,000 to make repairs and upgrades to the dam. According to Consulting Engineer Kevin Yezdimer of Princeton Hydro, the revolving loan opportunity only arises every three to five years, therefore they were requesting the full amount so if the project needed additional funds, they would have them readily available without having to wait for the loan to come back around. Wedgwood Country Club’s loan support request was for $125,000 to cover regulatory requirements and permits, according to Maser Consulting P.A. Engineer Andrew Banff. According to Township Clerk Leo Selb at the meeting, the motion was for a conditional letter of support for the loan with the option of reserving the right to withdraw at the town council’s discretion. The motion for Kandle Lake failed with a 4–1 vote, Council President Nick Fazzio being the only member to vote yes. Both Wedgwood Country Club and Bells Lake requests were denied with a 5–0 vote. “I just wanted to say thank you all for coming in, but I just don’t think it’s prudent to risk township taxpayers dollars on private dams,” Councilman Sean Longfellow said following the vote to deny the co-sign requests. Megan Doherty (right) was appointed as a special law enforcement officer class I in the Washington Township Police Department. Pictured with her are Council President Nick Fazzio (left) and Chief of Police Patrick Gurcsik. Council appointed Megan Doherty as a special law enforcement officer class I in the Washington Township Police Department. According to Gurcsik, Doherty was a police explorer for the past five years, graduated WTHS last year and received the annual Fraternal Order of Police scholarship. 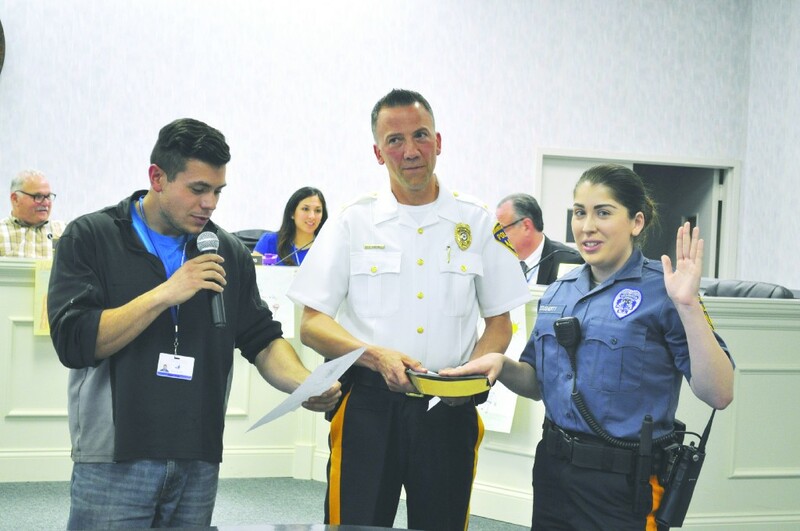 Doherty has entered her sophomore year at Rowan College at Gloucester County and recently graduated the Gloucester County Police Academy. Council approved a resolution authorizing a public auction for 20 police vehicles. The vehicles will be auctioned at J.J. Kane Auctioneers in Plymouth Meeting, Pa.
Council adopted an ordinance changing the speed limit on Stage Coach Road from 40 miles per hour to 35 miles per hour from Whitman Drive to East Black Horse Pike. Beginning June 1, the Municipal Building will be closed on Fridays until Labor Day. Normal hours will be Monday through Thursday, 8 a.m. to 5 p.m.